Columbia, Mo. (Oct. 30, 2018) — Tessa Weinberg, a print and digital journalism senior, will head to Washington, D.C., in the spring as the Missouri School of Journalism’s David Kaplan Memorial Fellow. Students selected for the program spend the semester working behind the scenes at the ABC News Washington Bureau. Stacia Deshishku, deputy Washington bureau chief at ABC News, chose Weinberg of Los Angeles, California, from a group of three Kaplan Fellowship finalists identified by a faculty screening committee. Print and digital journalism senior Tessa Weinberg has been named as the 26th annual David Kaplan Fellow and will spend the spring 2019 semester at a paid internship working behind the scenes at the ABC News Washington Bureau. According to Mike McKean, an associate professor who has chaired that committee since it began in 1992, Weinberg stood out, though the competition was the stiffest in many years. Along with a $10,000 stipend from the Kaplan Fellowship fund, Weinberg will receive a full-time, paid position for the 2019 spring semester. According to Weinberg, writing and reporting has always been a way to satisfy her curiosity and foster empathy between people. 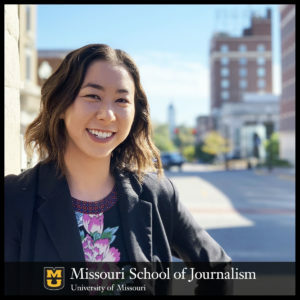 She said during her time at the University of Missouri, she has learned journalism can be used as more than just a tool to inform. Currently, Weinberg is a state government reporter on Associate Professor Mark Horvit‘s beat at the Columbia Missourian, the School’s digital-first, community newspaper. She also works as an editorial assistant at Investigative Reporters and Editors (IRE) where she contributes to the quarterly journal. Weinberg also produces, reports and hosts the IRE Radio Podcast, a program that interviews award-winning reporters, editors and producers to hear how they broke some of the biggest stories of the year. Weinberg says she applied to the Kaplan Fellowship for the chance to be at the center of politics in Washington, D.C., and to push herself to grow by learning the ropes of a broadcast newsroom. The fellowship honors the memory of David Kaplan, who was a producer for ABC’s Sam Donaldson. Kaplan was killed while on assignment for ABC News in 1992 in Sarajevo, Bosnia. Donaldson, a 40-year veteran reporter, correspondent and anchor for ABC News, created the program with funds that he and his colleagues donated to honor Kaplan. The Missouri School of Journalism was chosen to award the fellowship due to its renowned reputation for hands-on training of both reporters and producers. Dec 2, 2005: MA Student Named 2005 David Kaplan Memorial Fellow at ABC News in D.C.
Oct 27, 2004: MA Student Named 2004 David Kaplan Memorial Fellow at ABC News in D.C.